It was a warm, sunny July day when my wife and I hiked the Harding Icefield trail. We were blessed — such days are not common in this area. 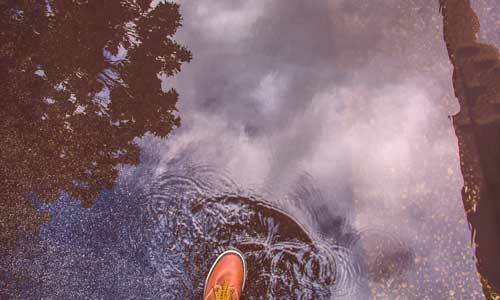 The nearby town of Seward averages 72 inches of rain per year. 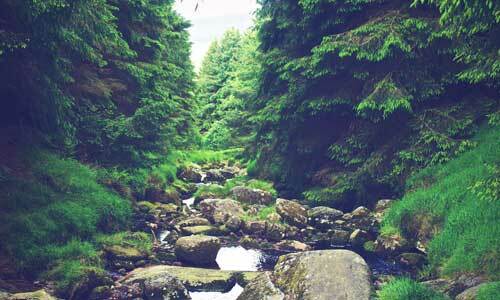 This trail is a tough day hike, gaining 3,000 feet of elevation in only 4 miles. 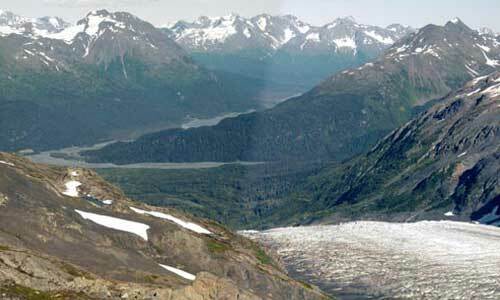 If you’re up for it, you’ll be rewarded for your effort with stunning views of Exit Glacier and the Icefield — a 300-square mile ice cap that spawns about 40 different glaciers. 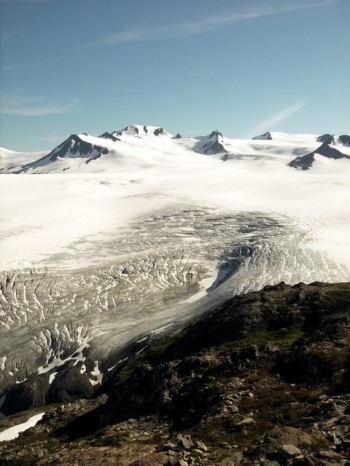 It is the largest icefield contained entirely within the United States. 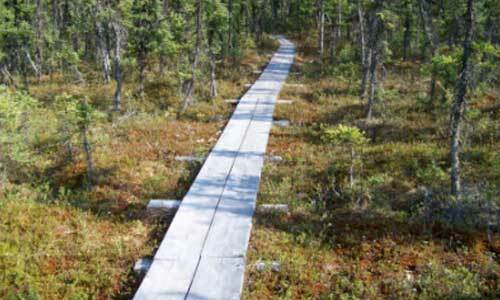 The trail starts out as a leisurely forest walk, but before long it begins to climb steadily. Some sections of the trail are extremely steep, like climbing a ladder. Be prepared for a workout! You’ll ascend above treeline into shrubby plant growth, until you reach a nice viewpoint at 1.5 miles. As the trail climbs higher, you pass through fields of wildflowers with nice views of the nearby glacier. Keep your eyes open for wildlife. We saw a friendly marmot right alongside the trail, probably looking for a handout. We also saw a black bear far away across a gully, playing in a snowfield. Mountain goats are also commonly seen here, although we didn’t spot any on our trip. 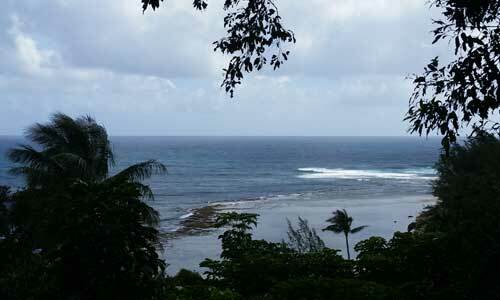 There is another great viewpoint at about 2.5 miles, and the view just becomes more spectacular as you climb higher. 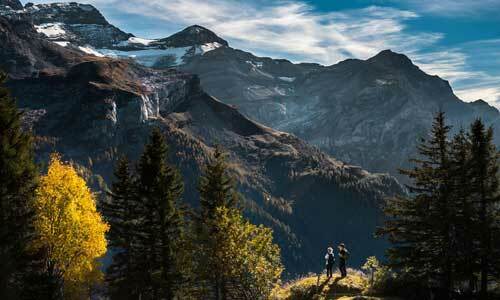 The trail ends at a rocky overlook with an expansive view of the vast icefield. Dark peaks jut out of a sea of white as far as the eye can see. Do not go out on the ice unless you are experienced in glacier travel; hidden crevasses pose a grave danger. Although we were fortunate to have a beautiful, warm day, you should always bring a warm jacket and rain gear for unexpected weather changes. 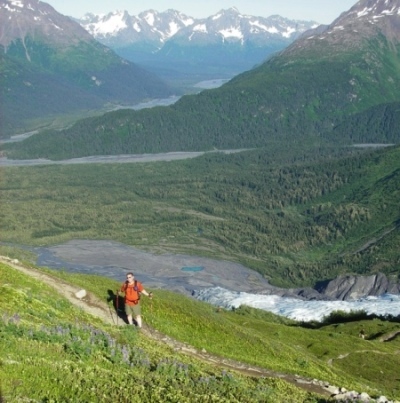 The Harding Icefield trail is definitely a must-hike if you are exploring the Kenai Peninsula. It isn’t easy, but it is worth the effort. My family and I just did this amazing hike ages ranged from 52 years old to 8 years old and it was gorgeous. Certainly it isn’t a hike for everyone, but if you can stick with this steep climb to the top/end then you will certainly be grateful you hung in there. We will certainly do this again on our next visit, because seeing this amazing ice field just once isn’t enough.